Brock Versus Rock was a small project I made a short while ago. 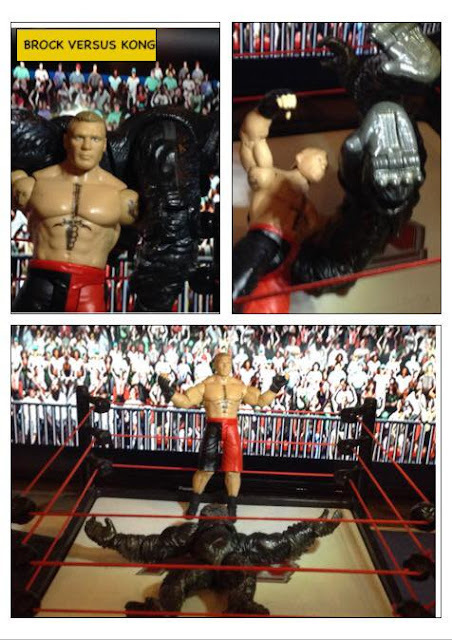 It was something I made and edited in one day using an ipad camera, a toy UFC octagon and 3 action figures. The first fight was just a test project to see what was possible and what would happen if Rocky stepped in the octagon and seeing as I had a new Brock Lesnar figure it was a no brainer. After the first fight many people enjoyed it but the same amount were upset about a few things, mainly the outcome of the fight. I had a feeling this might happen thats why I set up the sequel just in case. Enough people saw the first fight and seeing as it got people talking I made sure the rematch was everything the first fight wasn't. The first fight had no back story we just went straight in and it was a short affair. This time round we have gone to 60 plus pages of story and action. As well as adding many characters into the fold I built a few mini locations from scratch such as a bar, a wrestling gym, streets and the awesome arena where the fight takes place.